By being mindful of your activities throughout the day, you will be sure to stay healthy and fit at work! If you're reading this, you're either sipping on your morning cup of tea, catching up on blogs before bedtime, or sitting at your desk. If you're sitting at your desk, take a moment to think about how much time you spend there. Whether it's your home office, your corporate office, or wherever you make your creative magic happen. Do you find that you are sitting and staring at a screen more often than not? If so, today's article from our friends over at Treato will inspire you to be a bit more mindful in your work space. Did you know that you spend more waking hours during the week at work than you do anywhere else? As a result, your workday lifestyle habits can have a huge impact on your overall health. What do you eat while you're at the office? How much time do you spend in front of your computer screen? How often do you step outside to get some fresh air? These are the kinds of questions to ask yourself as you consider whether you pay enough attention to self­ care while you're on the job. We created a list of 5 mistakes to avoid if you want to stay healthy at work. If you think you do any of these, then it's time to switch up your daily routine! Heart disease​. Sitting for extended periods of time has been linked with high blood pressure and high cholesterol. People with these conditions are at higher risk for cardiovascular disease. Diabetes​. A sedentary lifestyle can cause the pancreas to produce excessive insulin. When this happens, you can develop diabetes or other conditions. Tight hips and weak glutes​. When you spend most of your day seated, your hip flexors become tight, which makes you less flexible. And because your glutes aren't doing any work while you're sitting, they can begin to atrophy. Tight hips + weak glutes = knee and back pain. &ellips; Scary, huh? The good news is that there's an easy solution to sitting too much: sitting less! If possible, spend half of your day seated in a chair and the other half on your feet. Switch off every hour or two. If you can't stand at your workstation, try to get up and walk around every 30-­45 minutes. When you are sitting, make sure you have good posture (upper back straight, shoulders relaxed, elbows at a 90­ degree angle, feet flat on the floor). At home, while you're watching TV, do some yoga poses that stretch out your lower back and hip flexors. There's a reason why coffee shops have their longest lines first thing in the morning: Lots of people love starting their day with a caffeine boost. And there's nothing wrong with that! In moderation, coffee has been shown to have real health benefits. However, heavy caffeine consumption -- more than 4 cups a day -- can cause nervousness, anxiety, upset stomach and elevated heart rate. When you find yourself walking to the break room for your regular afternoon pick­-me­-up, pour yourself a cold glass of water instead. If you drink a lot of coffee, which is a diuretic (it makes you pee a lot), then there's a good chance you're often dehydrated. Even being a little dehydrated can make you feel tired and listless. Your water needs will depend on your body type, exercise habits, and any health conditions. While it is possible to drink too much water, you'll be OK if you only drink when you feel thirsty. Have you ever been in "the zone" at work? You're typing away at light-speed, responding to emails left and right and completing tasks on your to­ do list like it's nobody's business. Then, suddenly, your mind starts to wander a bit. Your words­ per ­minute rate slowly decreases. You start thinking about lunch or dinner (or happy hour). What were you working on again? When you feel yourself losing focus, take a break. Our brains, like our muscles, need to rest when when we're pushing them to the limit. Put your computer to sleep, get up from your chair and do a lap around the office. Maybe step outside to grab coffee or go for a walk. If you don't want to leave your desk, catch up on news for a couple minutes or read a silly BuzzFeed article. Pushing your brain too hard will lead to decreased productivity and, over time, burnout. On other other hand, stepping away from a challenging task, even if only for a moment, will allow you to refocus and perhaps give you the insight needed to tackle a problem in a different way. By now, we should all know that an office -- really, any room where humans spend a significant amount of time -- is a giant germ incubator. This is especially true during cold and flu season, when a lot of people feel obligated to tough it out even when they're feeling under the weather. Given all the objects that coworkers share (coffeemaker, copy and fax machine, conference room phone, microwave, stapler, etc. ), it's important that you sanitize your hands throughout the day. If you'd prefer not to use a disinfectant, warm water and soap will do the job. You should make a habit of wiping down your keyboard, mouse and desk every 1­2 weeks. If you have some downtime, you might even want to wipe down the common surfaces that you suspect the janitor skips. Your immune system will thank you. During the last few hours of a long day at the office, a tasty snack can give you the motivation you need to finish strong. Unfortunately, a lot of the snacks in a typical office kitchen are packed with sugar, carbs and other diet no-­no's. But research shows that seeing (or hearing) other people snack makes you want to munch on something too. How can you resist? Well, to start with you should remember that sugary treats will only make the dreaded afternoon slump worse. Instead of a cookie, grab an apple. Apples are filled with nutrients and proven to boost your energy. If you can't find any healthful snacks in your office, try packing your own. Fruits, veggies, and nuts are all part of a healthy diet and will help keep your energy constant throughout the day. 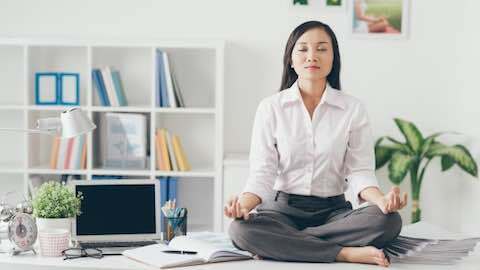 So, today while you're sitting at your office, try incorporating at least one of these work-space wellness tips into your day to ensure that you maintain a vibrant and healthy body! Article: Copyright ©, Studio One.